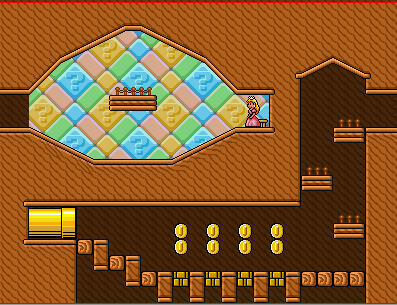 This is the first level of my future world, right now its just titled "wood world 1"
Each of the levels in this episode will have a star appear if you collect all of the red coins (going to change them into "star coins" or something later. I planned on this being the very first level in the episode, so I wanted to make it as un-punishing and straightforward as possible, while still having some minor setbacks. After having a few people playtest this, it seems it is very easy to finish which is what I intended. I have updated this level four times with pretty major piece changes after I watched someone else play it. There is a bonus area you must find in order to find the star. The "star room" is pretty easy to find anyways. 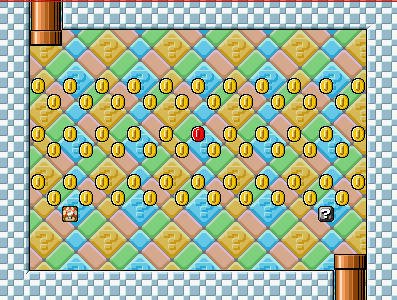 This level is too easy to finish, and there's not really much anything to see or do except run to the right. There's only 14 NPCS, a single power up, the entire level is incredibly flat and there's not much BGOs or decoration to be seen. Also the bonus room doesn't have any music, which is kind of weird.